In Pula Imvula November 2016 the article ‘Keep rainfall records to reduce risk’ which was about keeping rainfall records and assessing the moisture content of your soil, can be read in conjunction with this article. Many thanks must be extended to the Johnson family farming at Waterland for providing a 101 years of rainfall data. The Johnson family has farmed in the Eastern Free State and must be congratulated for being able to keep meticulous rainfall records over three generations of farmers for this extended period. Rainfall records can be used in many ways. Knowing the long term annual and monthly patterns can be used in the broader aspect of calculating the probable runoff into large farm dams and water usage in general and for crop production planning on your farm. On larger farms the farmer should keep records at various locations depending on land use in low and high potential cropping sections and areas mainly used for planted pastures and natural veldt. The conservation of moisture in the soil with the rainfall received in a long term crop and pasture rotation will be critical to the success of any farming operation. The huge costs and risks involved in producing crops can be mitigated by using the most optimum soil and moisture conservation cropping methods. Graph 1 shows the monthly rainfall received on the farm Waterlands over a period of 101 years complied from the daily and monthly records compared to the district and national rainfall averages. A wealth of information can be gleaned by analysing the data in various ways. Although the long term average is 607 mm/year the lowest rainfall received in a calendar year was 313 mm and the highest at 980 mm/year. The long term average for Waterlands is 607 mm compared to 585 mm/year for the larger rainfall district 71 within which the farm is found and the national average of 448 mm/year. Not shown is the Free State average of 590 mm per year. South Africa is a so called arid land with a comparatively low rainfall compared to other countries. However, the distribution of rainfall into higher falls in the crop producing area allows for the commercial production of dry land grain crops if good water conservation farming practices are followed. In areas where an average of 600 mm/year to 650 mm/year of rainfall is received and depending on the soil potential, cultivation of economically crops can be economically viable. 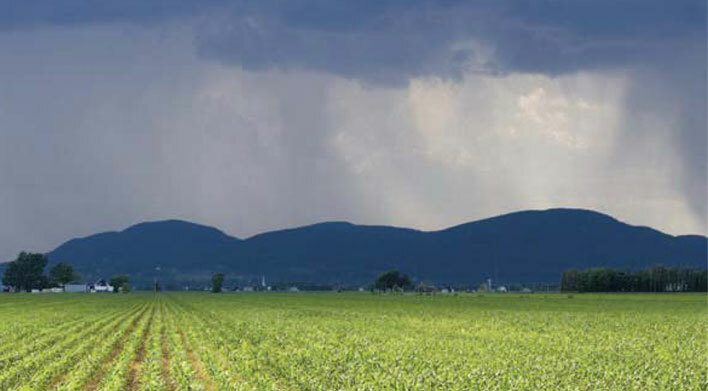 An important factor is the distribution of the rainfall within the winter and summer production seasons and which rainfall can be effectively used for a particular crop’s optimal yield. The graph shows that there is a very consistent pattern between local rainfall on a farm or district and our national annual pattern. 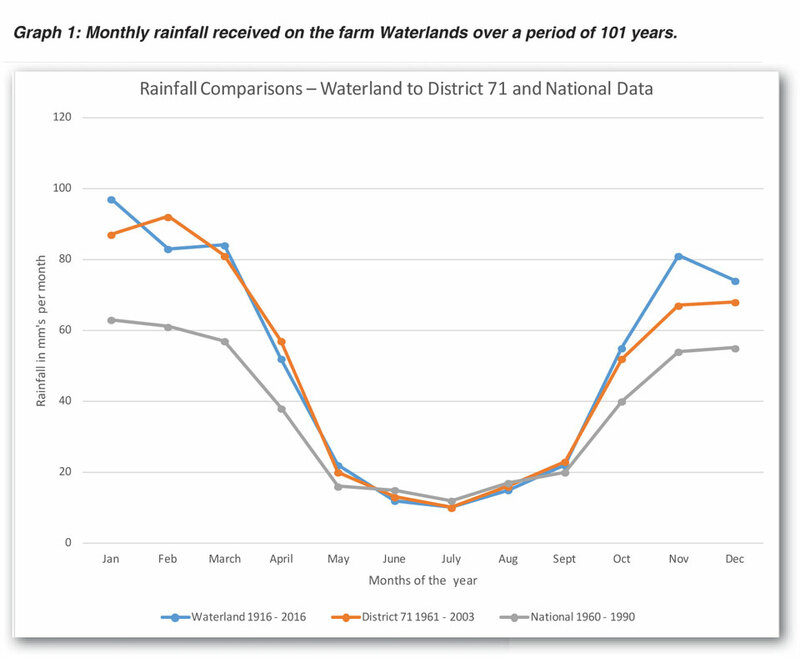 The analysis of the Waterland records show that 471 mm of rain or 78% of the total rain, over the long term, is received in the November to April summer production season and 136 mm in the winter fallow or non-growing season. The summer crop can be evaluated for the water usage and yield potential within the constraints of the 471 mm of rain potentially receivable in the growing season. Maize needs between 500 mm and 800 mm of water to produce a crop ranging from 3,5 t/ha to 6 t/ha depending on cultivar, soil potential and heat units received in your production area. With good conservation practices it is possible to store most of the 136 mm of rainfall in the lands between crops. Thunderstorms of over 50 mm in the summer production period will result in some runoff of excess moisture that the soil can absorb. If we have, for example, 50 mm of runoff per annum we only have 421 mm of moisture available in the summer season plus the portion of winter rainfall saved in the soil for crop growth in any of the summer crops. The total estimated moisture available can be then used to more accurately estimate the optimum yield targets to be established for each crop. Given the soil depth and rainfall amount and pattern it would not be wise to fertilise or increase inputs to aim for a 5 to 6 ton maize crop. These yields would only be probably achieved once or twice in 30 years when above average rainfall was received. A 3,5 t/ha target would be more realistic in these circumstances. Use an accurate evaluation of your specific long term rainfall records, keeping patterns in mind for the planning of more realistic and economically viable crop yield targets.